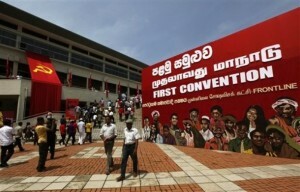 More than 5,000 people packed Colombo’s Sugathadasa stadium for the inaugural conference of the Peratugami Samajawadi Pakshaya (Frontline Socialist Party – FSP) on 9 April 2012. Most were members and sympathisers of this new Left party – a breakaway from the Janatha Vimukthi Peramuna (Peoples’ Liberation Front – JVP); but many representatives of other radical Left parties, Left intellectuals, and progressive social activists were also in attendance. The emergence and consolidation of the FSP is an important and hopeful development for the revival of peoples’ movements in Sri Lanka in the post-war era, following decades of retreat of the labour and left movements. Underlining the internationalism of the new party, and its understanding of the relationship between national and global struggles against capitalism, the Convention was dominated by speeches and messages from international guests and representatives of FSP branches in England, France and Italy. Greetings were also delivered by Left groups within Sri Lanka, mainly of Trotskyist and Maoist lineage, including Vickramabahu Karunarathne on behalf of the Nava Sama Samaja Party. A ‘Party for Us’ announced the new party in a poster and social media campaign in the weeks leading up the Convention, showcasing images of the poor and exploited – of different classes, occupations and ethnicities, who are unrepresented in the present political system. Currently, the working class movement is passive and its traditional leadership are unwilling to challenge the government on the unbearable cost of living and the pillaging of workers savings to service government debt and stimulate the stock market. The number of strikes and workers on strike has sharply declined to only 8 recorded strikes in 2009, with only 5,320 workers involved in contrast to 52 strikes of over 200,000 workers in 2006. The governmental Left is palpably weaker in policy influence than in previous coalitions and unable to even moderate the authoritarian capitalism of the Rajapakse government. The organised Left outside the government has declined numerically and in social weight and is struggling to regenerate itself. While there have been some significant social struggles of free trade zone workers, university teachers, and fisher-folk in the past year, these have been short-lived episodes with only partial defensive gains at best. The excitement of an impressively organised and staged launch was overshadowed by the abduction of two leading members of the new party on the eve of its Convention; in a transparent attempt to sabotage the event and to sow disarray and confusion in its ranks. Premakumar Gunarathnam and Dimuthu Attygala were abducted in two separate incidents within hours of each other, following a pre-Convention meeting of the leadership on 7 April. Their party was unequivocal in holding the state responsible for the abductions and in expressing the widespread sentiment that it was a prelude to their extra-judicial killing, as has been the despicable trend in Sri Lanka. In an unprecedented development, Gunarathnam and Attygala were both released from captivity on 10 April. Their safe release is only due to the broad and diverse political coalition that protested against their abduction within Sri Lanka, the diplomatic pressure of the Australian government, and an international solidarity campaign that was swiftly organised including through the Fourth International. Late last year the media began carrying reports of a major split within the Janatha Vimukthi Peramuna (JVP), which has been Sri Lanka’s largest Left party (although many Sri Lankan leftists object to characterising it as socialist because of its Sinhala nationalist stance on the Tamil national question). The JVP’s roots are in the Maoist Ceylon Communist Party in the late 1960s and its membership and supporters are drawn from the Sinhala rural and semi-urban petty-bourgeoisie. Its central leader, Rohana Wijeweera, was expelled from the CCP-Peking and formed his own secretive organisation which led two armed insurrections against the Sri Lankan state in 1971 and later in 1987, which were brutally crushed with the loss of tens of thousands of young lives. In the second insurrection, all but one member of its leadership was physically eliminated. In the early 1990s, the JVP revived its organisation and entered electoral politics. As the bourgeois populist Sri Lanka Freedom Party adopted the neoliberal policies of the right-wing United National Party after forming a new government in 1994, the JVP became the beneficiary of social and political discontent and a pole of attraction to radical students and young workers. Its parliamentary caucus grew from 1 member in 1994, to 10 in 2000 and 16 in 2001, and peaked at 39 (in the 225 seat legislature) in 2004. It also made significant gains among organised workers especially in the state and private sector, often through poaching members from rival unions; while also dominating politics in universities through its militant student unions which were not averse to using violence and ragging to exert its authority over the administration and students alike. However, the JVP faced two ways: it presented itself as an anti-imperialist and an anti-capitalist force struggling for socialist revolution in Sri Lanka, while simultaneously projecting itself as a patriotic nationalist organisation rooted in Sinhala Buddhist culture and committed to the preservation of the unity and territorial integrity of the country. As former general-secretary of the JVP, Lionel Bopage – who also pushed in the late 70s and early 80s for his party to recognise the existence of Tamil national oppression and to support the Tamil struggle for equality and justice – commented: “Since the late 1990s the JVP not only supported the chauvinist verbal onslaught against the Tamil people but also became an active collaborator in the brutal repression carried out by the state against the Tamil people. Thus, it has to bear some responsibility for the socio-cultural and economic outcomes that the working people of the island are experiencing today. For dividing the people by clouding its consciousness, the JVP, in particular its nationalist bloc used chauvinist and fundamentalist slogans to the maximum effect. The JVP camouflaged its ultra nationalist stance with socialist phraseology”. The JVP have been virulently opposed to any proposals for power-sharing with the Tamil nation. It was a bitter critic of the draft 2000 Constitution, the political proposals debated during the Cease-Fire Agreement (between 2002 and 2005), and withdrew from the All-Party Representative Committee process on constitutional reforms. It even continues to oppose the 13th Amendment to the Constitution that introduced limited devolution of powers to the regions, despite contesting elections for and being represented in those provincial councils. The JVP were vocal supporters of the war and of the use of military force to suppress the LTTE. In their view, the division of the island through creation of an independent Tamil homeland (‘Tamil Eelam’) would benefit US imperialism and Indian ‘expansionism’ in the region. The logical political conclusion of this perspective was to form alliances with the Sri Lanka Freedom Party (SLFP)-led government that was prosecuting the war. Thus, the JVP – like the ‘Old Left’ Lanka Sama Samaja Party and Communist Party of Sri Lanka decades before it – succumbed to the pressure of ‘coalition politics’ (popular frontism) by aligning itself with the SLFP, first by joining the Chandrika Bandaranaike Kumaratunga government in 2004, and later by vigorously supporting the election of her successor Mahinda Rajapakse in 2005. As the flawed ‘peace process’ and full-blown war broke out after August 2006, the JVP mobilised Sinhala society in warmongering. The government even arranged for the JVP parliamentarian Wimal Weerawansa to regularly address soldiers at the battle-front, in a morale-boosting exercise. This twin policy of collaborating with the neoliberal governments of Kumaratunga and Rajapakse as well as its non-differentiation from the Sinhala chauvinist campaign against Tamil rights sparked an internal debate within the JVP on its revolutionary socialist identity. Hidden from public view, the different viewpoints were partially revealed when the camp around the Sinhala chauvinist Weerawansa broke with the party and joined the Rajapakse coalition in April 2008, along with 10 other JVP parliamentarians. The JVP lost its most charismatic public speaker along with a front organisation of Buddhist monks and laity that was in the vanguard of agitation against political resolution of the national question. At the time, Weerawansa revealed that there was a group within the party that wanted it to rethink its political positions, including on the Tamil question, and warned darkly of ‘Trotskyist’ deviations. This was clearly an exodus of the Sinhala nationalist bloc within the JVP. It allowed the JVP to reassert its political independence from the Rajapakse regime. In fact, soon after the end of the war in mid-2009, the JVP in an about-turn began demanding the end of emergency rule, the repeal of the Prevention of Terrorism Act, speedy rehabilitation and release of LTTE combatants and Tamil political prisoners, and for respect for democratic and human rights. It also repositioned itself as a bitter critic of the Rajapakse regime but without any self-criticism of its own past political record of support. The debate continued within the JVP as a group of dissidents attempted to win the traditional leadership of the party over. It was only in August 2011, when it became clear to the dissidents that there was no democratic space for them within the JVP that they took the decisive step of forming a public faction known as the Jana Aragala Vyaparaya (Movement for Peoples Struggle – MPS). The dissidents began at a disadvantage. They were mainly second generation leaders recruited in the student movement in the course of the 1990s for e.g. Pubudu Jagoda, Chameera Koswatta, Waruna Deepthi Rajapaksa, Duminda Nagamuwa and others. The older members such as Senadheera Gunatilleke were only known within the party and unknown to the general public as the JVP has generally projected its parliamentarians as its public spokespersons complemented by its paramount leader Somawansa Amarasinghe and its General Secretary Tilvin Silva as its ideologues. Indeed, one of the MPS’ criticisms of the JVP is that its leaders were created through their entry into elected bodies such as parliament, and not through peoples’ movements. The mainstream media was swift to describe the dissidents as ‘extremists’ and hint that they represented a throwback to the JVP’s armed adventurism. The identity of one of their key leaders, Premakumar Gunarathnam, was leaked to the media; and his Tamil ethnicity was used to throw mud at the new formation, manifesting Sri Lanka’s racist political culture. However, the MPS was able to win the loyalty of most of the bureaus of the JVP (for e.g. student, education, publications etc. ), as well as the majority of its district structures aside from Anuradhapura, Hambantota and Kurunegala. Also, many of the JVP’s overseas members, excepting perhaps in Japan, have also joined the new formation. The new party is evidently well-funded in comparison to other Left parties. It has several full-timers and an efficient and disciplined organisational structure. It is supporting the Janarala newspaper (edited by the team that previously published the pro-JVP Irida Lanka weekly). It has organised several public events in the last few months to consolidate its membership and explain its differences with the JVP. It is able to mount posters island-wide and within the space of a few hours, such as immediately following the recent abduction of its leaders. Like the JVP it is able to count on the selflessness and self-sacrifice of its cadres and sympathisers. Its overseas committees are also critical to its income and in developing relations with fraternal organisations abroad. The JVP has the support of 3 of the 4 parliamentarians returned in 2010; only Ajith Kumara representing Galle district has joined the FSP. It also has retained the support of its trade unions and their membership. However, its peasant front leader (and former member of parliament) S. K. Subasinghe has joined with the dissidents. The JVP has also secured most of its assets including headquarters and many district offices. Initially, the MPS aimed to gain leadership of the JVP and therefore it has presented itself as the authentic or genuine inheritors of the legacy of Rohana Wijeweera. So, last November on Wijeweera’s death anniversary that is marked as ‘Heroes Day’, there were two commemorations of JVP martyrs (Il Maha Viru Samaruwa) by the different factions. Although it has engaged in self-criticism of its past (that was distributed in book form at the inaugural convention), the new party has focused its critique on the post-2004 record of the JVP, particularly its support for the capitalist Sri Lanka Freedom Party. Therefore, it is still unable to confront the adventurism of the JVP’s two abortive ‘revolutions’, as well as the break from Marxism represented by Wijeweera’s position that the Tamil plantation proletariat (of recent Indian origin) constituted a fifth column of Indian expansionism; and his opposition to the Tamil liberation struggle. The split has already had a salutary effect on the JVP. In January 2010, it supported the presidential campaign of former army commander Sarath Fonseka, also backed by the United National Party and the Tamil National Alliance, and formed a motley electoral front with him and his supporters (ranging from disgruntled UNPers and SLFPers to military personnel) called the Democratic National Alliance (DNA). This alliance is now dead as the JVP has accepted that it was a mistake to ally itself with Fonseka and claims that it will not enter into coalition agreements with pro-capitalist parties in future. Also, the JVP has become more strident in its criticism of the militarisation of the Tamil-majority Northern and Eastern provinces of the island and in highlighting abuses of democratic and human rights in those regions. While the FSP is critical of the JVP’s position on the Tamil national question, its own perspective is still vague and ambiguous. It recognises the existence of multiple nationalities in Sri Lanka, but does not advocate the right to self-determination for oppressed nationalities. In fact its leaders have said that they oppose “separatism and federalism” and will seek to convince Tamils to “accept a solution which ensures equality and democracy to them”. We can agree that the existing 13th Amendment is not a solution to the national question and that we need to transcend capitalism to attack the roots of national oppression. However, as a beginning, does the FSP accept the need for its full implementation including the controversial exercise of powers over land allocation and police powers by provincial governments? And, will it join the campaign for “13+”, that is, for power-sharing with Tamils and other minorities and self-government in the North and East? This is a thorny issue for the FSP partly because the JVP opposed the 13th Amendment and killed leftists who (critically) supported the Indo-Lanka Accord that introduced the constitutional reform during its second insurrection. It is commendable that the MPS/FSP has not yielded to the prevailing Sinhala nationalist ethos and has publicly declared that it is engaged in dialogue with ex-LTTE combatants and willing to accept them into its ranks. The government has unleashed a ferocious propaganda campaign against it for daring to forge unity between the Sinhala and Tamil oppressed and to overcome the mutual distrust and suspicion that has polarised the exploited and marginalised of both peoples. However, the new party cannot take cover under the threadbare position of the JVP that Tamils and other minorities must await ‘socialism’ for the satisfaction of their democratic demands. There also needs to be clarity on whether we mean the same thing by ‘socialism’ and the road to socialism. What is the relationship between democracy and socialism? How do we entrench and assimilate democratic practices within our own organisations and mass organisations? How should socialists work within the workers movement when it is divided on party political lines? What is the relationship between struggles against national oppression and struggles for socialism? For instance, the FSP’s inaugural convention appears to be modelled on those of the JVP which are rallies of the faithful and not delegate-based conferences where open debate takes place and the leadership is transparently elected. Instead, the new leadership (an 18 member central committee) of the FSP was announced at the Convention, having apparently been pre-selected by an inner core membership. Subsequently, the central committee has elected Senadheera Gunatilleke as its general secretary and G. Kularatne as its organising secretary among its 9 member political council that also includes Premakumar Gunarathnam and Dimuthu Attygala. It is to the credit of the Frontline Socialist Party that since its inception, it has been open to collaborate and dialogue with other political traditions. This sharp break from the political practice of the JVP cannot be over-stated. The JVP has always been a sectarian party that placed its self-interest over those of the broader movement. It avoids engagement with the radical Left and is unable to collaborate on joint campaigns even in the trade union and social movement. The JVP only considers itself to be the genuine party of the Left. This has isolated it and contributed to its political stagnation. In contrast, the comrades of the FSP understand that the working class is not homogeneous and that it will have diverse political tendencies. Therefore the FSP recognises that there has to be a plurality of the Left in the revolutionary movement and that the movement as a whole can only advance through grasping and channelling the various experiences of its constituents. The FSP has adopted the perspective that it does not claim to have all the answers and neither does it claim to have had a spotless past. In that spirit it has welcomed the participation of other groups in its Movement for Peoples Struggle which it intends to continue as a broad front while building its own party. This enlightened approach of the comrades of the FSP and the respectful manner in which it has been in dialogue with the radical Left including Trotskyist groups such as the NSSP, despite the hostility of the JVP towards this political tradition, is what is most encouraging in what are bleak and unfavourable times. In addition to common campaigns such as around disappearances and abductions, the current political dialogue should also take place at the base of the radical Left and not be confined to its leadership in Colombo. The FSP could open the pages of its newspaper, not only to promote greater understanding within the Left, but also to overcome the crisis of credibility of socialist ideas and politics. The NSSP has proposed to the FSP that it should jointly organise its May Day celebration this year with other Left parties and trade unions. Unitary initiatives such as these can be decisive steps towards greater convergence on the Left and inspire hope among those in struggle today and tomorrow. Another bunch of foolish dreamers pushing an out-of-date discredited 19th century, European political ideology on an mainly agrarian Eastern country in the 21st century. One hopes that their dreams will not turn into a nightmare for the others as their predecessors did in 89. Hasn’t anyone told these people that soviet Union does not exist any more and that China is communist in the name only? If they are pushing an outdated 19th century political ideology. Are you pushing an 18th century idea of Free trade and neoliberal politics mixed well with Sinhala Buddhist Fascism as the answer? Please dont discourage the only silver lining on the horizon where Tamils and Sinhalese could get together and work for a united Sri Lanka. I am not pushing anything. I see a bunch of people with same old ideas, polices and catch phrases which have been discredited all over the world, trying to push the same down the throats of people in Sri Lanka again. JVP has no mass support in the Sinhala community and this group will not have even a fraction of the support that JVP has. I am all for a united Sri Lanka but if you think this is the path to that, you must be delusional as these people are. And pray tell me, who told you that Free trade and neo-liberal policies are 18 century ideas? I thought 18th century was the peak of colonialism whose idea of trade was to invade countries, steal their resources and enslave the people and build empires. Could you define what you meant by United Sri Lanka. Without the benefit of globalisation of trade could you tell me how was it possible for you to use new technologies and access this forum? Far left policies always leads to fascism. Extreme left and right meet at an equilibrium point where difference between left and right vanishes. As for the new party policies has FSP reviewed its position on Up Country Tamils. Are they still being the fifth column of Indian expansionism? Another Sinhala/Buddhist/Aryan party rapped up in new packaging perhaps. I do not see much product differentiation between all these supposed to be left wing parties. Proliferation of chauvinists in cuddly left clothing will only exacerbate the problems. Vaus,DWE Gunasekera and Tissa Vitarana the leftist geriatrics among the fools and goons of the Rajapakse jumbo cabinet can learn a few lessons from this new party I am sure..
Or on second thought since they keep talking about western colonialism as if Lanka had not been independent for 63 years in order to find excuses to collaborate with the murderous Rajapakse regime, they (Vasu, DEW and Tissa) should be put in a home for the aged for those who have LOST THE PLOT! They are an insult to the left at this time – legitimating internal colonialism, occupation and militarization of minority regions in Lanka. Wow such organizational capabilities. Not every party can boast of being able to bring their entire vote bank to the party convention. I like it, FSP is the silver lining for Rajpakse bashes. This is their first party convention therefore any sane person would have understood that 5,000 attendees is an impressive number for a party which had only 12 months to get started. What are you mourning about? Proof of the pudding is in the eating, hence let the new party publish its declaration of intent (objective and policies) and follow them through by its own action plan. I suspect it might turn into another party on the fringe pandering to Sinhala/Buddhist/Aryan/ Chauvinists. This was of course just before the Gunaratnam faction pulled the plug on Somawansa. Even this writer acknowledges that Somawansa is smarter by calling him a moderate. From 200,000 workers on strike in 2006, to only 5000 in 2009, is a remarkable Industrial relations achievement , which would have been applauded and celebrated in the West. This remarkable deed would have earned , the relevant Ministers in these countries guernseys for good work and perhaps best Minister title in Europe. But the Delegates are sent from the same countries to tell our peasants, this is bad going. In addition, some of our expats living comfortable lives in these lands have also arrived to tell their brethren, strikes are good, Somawansa is bad and follow Mr Gunaratnam. Would these expats enjoy if they are forced to take time off without pay even if they didn’t take part in strikes, when they have gigantic mortgages to service?. Finally, If the current JVP is that pro Sinhala , where is this faction going to get their new members from?. It is in this context that I pointed out that you are peddling 18th century ideas without even knowing it. ie. in the 18th century that Adam Smith wrote The Wealth of Nations advocating Free trade as the solutions for all ills and Capitalism or industrial capitalism and the liberal ideas that we embrace came to gain momementum. The knee jerk dismissal of the left without thinking that it was the only ideology though corrupted everywhere at least criicised the ethno-politics of UNP, SLFP and the TC and FP and the TULF in the 50’s untill it too succumbed to SLFP majoritiarianism. What we have had in this country is ethno politics and not national politics, even the old left including the Old JVP had succumbed to that. “Finally, If the current JVP is that pro Sinhala , where is this faction going to get their new members from?. This is not party built from scratch, its a breakaway faction of the JVP. So the 5,000 attendees are likely ex-JVPers and the number is hardly impressive. The JVP bring tens of thousands of people to its rallies, but come election time we find out that is pretty much all the support they have. Actually the FSPS manifesto indicates it will be a looney left pandering to self-proclaimed Ubermensch wanting exclusive homelands. A fringe party nevetheless incapable of sending a single member to parliament. When the opposition mainstream parties are all but dead, having succumbed to the manipulations of the Excecutive, there is no harm in the youth trying to express their frustration in a democratic manner. At least they have the guts to stand up to this brutal dictatorship. I don’t understand which dictatorship you are talking about. Yes, we had once, but he is no any more. LTTE leader was the only dictator in recent past and all about him is over now. We do not need another Pinocchio but we desperately need a Jiminy Cricket, the conscience. As long as FSP acts as conscience I would be happy to welcome it even if the party fails to win any seat in the Parliament. We don’t need another Nationalsozialistischen Scheiße nor do we need another WPK of North Korea to run “a dictatorship of the people’s democracy”. Given the past history of ultra lefties ideologically FSP could end up somewhere in between. Please sit on the fence until their true nature is exposed. I am not against passive socialism in a democratic society, but we have now come to a key crossroad ,it is the duty of the parents to guide the misled youth who will fall prey to these foolish ideologies, while even the renowned communist countries like Russia & China are changing, I once told a russian lady that some Srtilankan youths wanted to overthrow the elected government & establish a ultra left government,she laughed & said “we were under communist rule for a long time & we know how hard it is,you people have not tasted it”. I already survived a bomb explosion where a colleague of mine died during the 30 years of brutal war,I do not wish to see another uprising,with bombs exploding in buses,markets,schools& youths being burnt on tyres ,etc..this is my frank opinion perhaps people who are inclined towards JVP ideology will not appreciate what I say but I thought of writing this because of the love I have for my country. ‘ATU’gami samajawadi peramuna. That is where they are heading,the attic! Can one realistically expect a new thinking and a new progrmme from a bunch that still carry the hammer and sickle.It is okay as in a democracy for them to hang on the fringes,provided they don’t become cats paw for people with agendas.Case in point is the Katunayake labour unrest. They deprived millions of private sector workers of a pension for their old age for a few thousand of garment factory girls who do not work long enough to qualify for the pension.This could have been sorted out easily through supreme court if the government was not listening.Finally they succeded in depriving a section of the population who actually genarates the income for the country of their rightful pension and an innocent youngster lost his life. Having got their pound of flesh dripping with blood and the show of prowess now go on as if nothing happened. As NV says proof of the pudding is in the eating. I am prepared to concede that it was ethno politics which prevailed in the country since independence that caused the prevailing rot. But it is going to take the FSP much to convince the ordinary man about that silver lining you are talking about. known devil than that newly found socialist angel-devil. Dictators are those who abduct people in white vans. Dictators are those who attack and break peoples legs who hold different views than their own. Dictatorss are those who lock up opposition politicians on various cooked up charges. Dictators are those who play aound with 80% of the countries economy. Dictators are people who erect cutouts of themselves at each stree corner using public funds. Dictators abduct people in white vans. Dictators stifle dissent and harrass opposition parties. Dictators kill and break the legs of journalists. Dictators install their friends and relations in important positions. Dictators are above the law. So you can decide which dictatorship I am talking about. Talking about dictators, some of the worst dictators hail from the communist bloc countries,for example Joseph Stalin–Soviet dictaor (1924-1953). Set up the first Communist cult of personality. Responsible for the deaths of millions in his purges and genocidal policies against his political opponents,Kim Il-Sung–Founder of Communist North Korea. Ruled (1948-1994) on the Stalinist model and set up a cult of personality. Passed power on to his son in the first hereditary transfer of power in a Communist system. Started the bloody Korean War in 1950,Mao Zedong (also spelled Mao Tse-tung)-Founder and ruler of Communist China (1949-1976), Mao led the Chinese Communist Party through a very long civil war, which he won in 1949, and founded the People’s Republic of China. Mao’s rule included several purges and bloody repression, inlcuding the so-called Cultural Revolution, which resulted in millions of deaths of people considered to be threats to Communist Party rule.Nicolae Ceausescu–Communist dictator of Rumania (1965-1989). Ruled on the Stalinist model and through a cult of personality. Considered one of the more ruthless Communist rulers in Eastern Europe. Ceausescu was overthrown and executed in a national uprising in 1989. Fidel Castro–Founder of Communist Cuba, Castro took power (1959-2008) through a revolution. He transferred power to his brother in 2008. The Castro brothers ruled through force and have driven hundreds of thousands of people to flee Cuba for a better life in the United States,Pol Pot was a Cambodian Maoist revolutionary, The combined effects of forced labor, malnutrition, poor medical care, and executions resulted in the deaths of approximately 21% of the Cambodian population. In all, an estimated 800,000 to three million people (out of a population of approximately seven million) died under his three-year premiership.these are some facts. When the end of capitalism is in the horizon, even in America, how the 1% is dominating & manipulating the 99%, Socialism could be the answer, besides who is going to challenge this corrupt rogue regime. Frontline Socialist Party is my best bet. It would be good if the editors would credit the original website -” Links: International journal of socialist renewal” at http://links.org.au/node/2829. Too many pieces on this site aren’t credited. Though there were periods of declinations or stagnations in the history of mankind, humanity should evolve & will,communist ideas had been tried out & experimented in many countries,& after many years slowly it started to unravel,one should go deeper into the subject & analyse to find out why it failed,if one is intelligent one should not swallow every word as the gospel truth that Karl Marx or Lenin preached, certainly there were positive aspects in these theories,one should inquire why the people of those communist bloc countries get fed up with communism,& during the cold war why did east Germans try to defect to west Germany risking their lives of being shot at or by crossing mine fields in the process (My German teacher took the risk of running to cross the east German border while bullets shot by east German guards were whizzing past her head) ,why did Cubans take risks of trying to cross the shark infested ocean in inflated rubber tubes to reach the USA side,even today we hear of starving north Koreans taking enormous risks to defect,but it didn’t happen vice-versa, even the theoretician Mr.Kumar Gunaratnam, of the newly formed Frontline Socialist Party – FSP,instead of going to Cuba,or North Korea,migrated to a renowned capitalist country Australia from where he gives counselling on the telephone on the evil nature of capitalism & its dangers & the importance of overthrowing the democratically elected Srilankan government,to the FSP working committee,all the while enjoying the freedom & comforts offered by the democratically elected capitalist Australian government,I have spoken to many people from the former communist bloc countries & learnt much,democracy offers the people to choose a government & kick them out if they dont like them,& the freedom to create new ideas innovations machines,poetry essays paintings etc…without any political hindrance, on the other hand there are negative aspects of Capitalism too, in the united states there is a big gap between the poor & the rich, if you are poor & lazy it would be hell there, but if you are hard working even if you are poor,you have a chance of coming up in life,I am not totally against socialism or capitalism,one should amalgamate the best ideas of the two. Ok – thanks for clarifying things, DBSJ. My apologies for not catching the credit that Links gave to you for first publication. 5000 people who attended is the full strength of the party (give or take a few thousands). These guys won’t make any impact on a voting platform but can create significant irritation to the government. I think the 1977 0 seat election defeat basically spelled the end of the mainstream defeat of the left. If not for the proportionality voting system, JVP too would have not got a single seat other than Tissamaharama PS, which they won briefly and lost again. Sri Lankan people have completely rejected the left. With a ridiculously weak UNP trying desperately to make the strangest bedfellows, and the Tamil nationalist TNA being the only viable opposition, MR and his team will stand supreme for a long time, like it or not and all communities should take in that reality and work towards a tangible solution. Why are the majority of people here being so negative towards the goals of a party that is essentially wants to break down the barriers, both economic, political and ethnic, that have existed since the days of colonialism (and have only gotten worse since). When the alternative is the rampant sinhala nationalism of the SLFP or the UNP, who use the ethnic and poliical divisions in lanka to desperately hold on to power, why would a lot of you so apathetic and dismissive about a party that is trying to put forward a obviously rational idea of political and economic equality. « ‘Hey Geneva’ by Ajith Kumarasiri! Birth of Sinhala Blues?